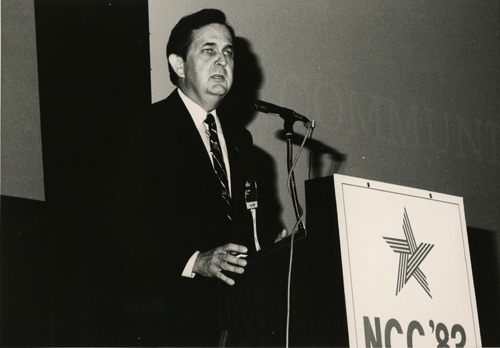 This is a black and white of John Imlay standing behind a podium speaking at the National Computer Conference in 1983. He is wearing a dark suit and striped tie. His right hand is resting on the podium. Light is coming from the direction of the camera. Behind John Imlay is a white screen displaying the partial word "COMMUNI..."